These remarkable photos from Nancy and Bill Steel’s family album offer a rare glimpse into early 20th century Riverton. Do you recognize this Riverton landmark in its earlier days? Built in 1909 as the clubhouse for an organization celebrating its 125th anniversary in 2015, it has a much different look here than in a later postcard view. In an August 3rd post called Hot enough for ya? candid shots of the Fitler family of 109 Bank Avenue cavorting in a homemade swimming drew possibly the most traffic ever to this website and rekindled memories of those who later learned to swim in Bay Ruff’s pool. These scans came from that same album. This photo had no caption or date, but you can see the Yacht Club in the background. Somewhere I have the name of a pilot who flew passengers around Riverton for a fee. But who is the woman? We are often asked here what we have on file about the history of a house. Except for a few founders’ homes, we have precious little, I am afraid. However, the 1999 Riverton National Register Historic District Inventory has short summary descriptions for over 500 structures. Mrs. Patricia Solin, a frequent contributor to the Gaslight News, reports that she will have some helps to publish here later this fall for those wishing to research the history of their home. A new homeowner once told me how much they appreciated receiving from their seller a box of documents and old photos about the history of their just purchased house. These photos taken in 1905 would be invaluable to a person trying to recreate original architectural details. Note the oil lamp on the post that predates the Welsbach gaslamps. Do you have any photos of your home back in the day you could send in? In a year in which we have a woman candidate running for president, an intriguing sequence of photos about suffragists marching to gain the right to vote prompted me google some of the names I read in the captions. I learned Col. Ida Kraft (also spelled Craft) and her army of Pilgrims were actually a real thing and a very big deal. But are the pictures in this album because a family member was involved in the march? The captions do not say and the Steels do not know. I couldn’t wait for cold weather to share this next one. I have heard of people walking on the river ice way back when, but a wind powered iceboat must be something to see. Delving into the Steel family album reminds us that there are still some surprises to be found in Riverton history, but sometimes they present more questions than answers. 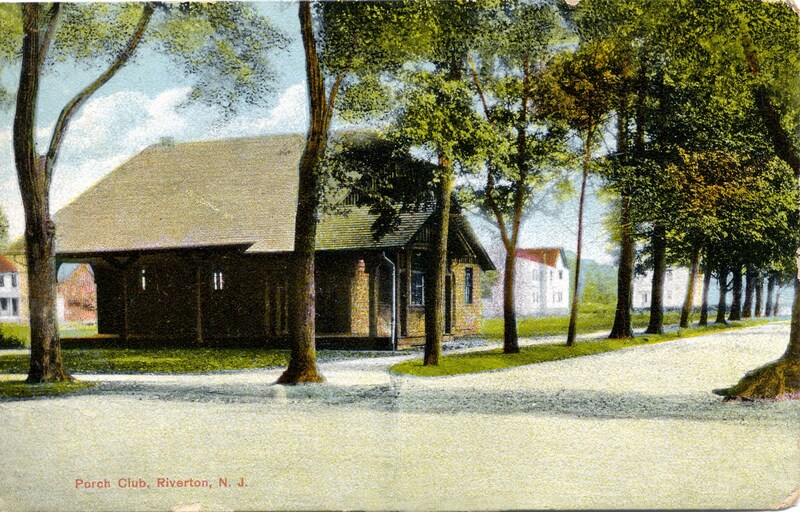 If you have any more surprises to throw into the mix, or can help connect the dots to some of these random bits, please join the conversation here at rivertonhistory.com. Won’t you support the Historical Society of Riverton’s efforts to preserve and promote the history of this “unique” town in the only way that matters with your membership? Previous Previous post: 103 years old this week!